The Harbour Bridge. The Old Coathanger. Call it what you will; alongside the Opera House, the Bridge is one of Sydney’s two most recognisable landmarks. I remember being intensely jealous of Billy Connolly when, in his World Tour Of Australia TV series, he climbed to the top of them both. 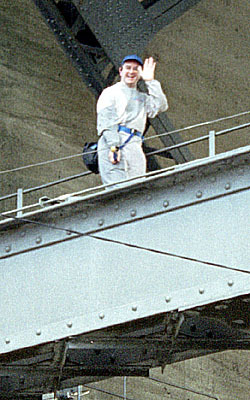 When that series was filmed, back in 1995, being allowed to climb the Harbour Bridge was a privilege: a locked door that only Billy’s fame  and perhaps his credentials as a former Glasgow shipyard welder  could open. 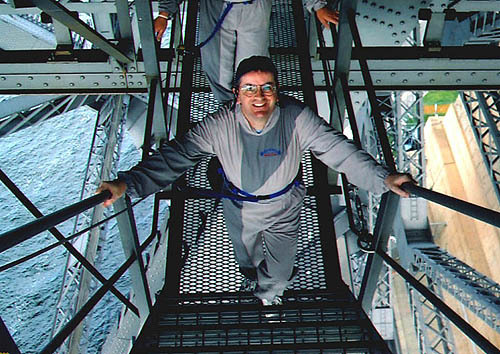 Five years on, and BridgeClimb is one of Australia’s most successful and money-spinning tourist operations. Parties of up to a dozen eager visitors, led by a trained climb leader, set off from the base under one of the stone arches in Cumberland Street every ten minutes or so, rain or shine, for twelve hours or more of every day of the year. 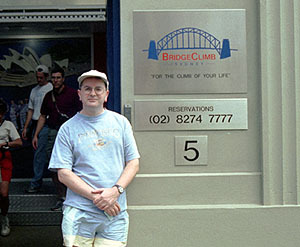 It took Paul Cave, the founder of BridgeClimb, years to convince the authorities that it was feasible to take groups of tourists to the top of the bridge; when he’d proved he could satisfy every last one of their safety requirements, they reluctantly gave in. Having seen the popularity of the climb, and the hundreds of thousands of dollars the operation has poured back into the upkeep of the bridge, the naysayers must now be cursing themselves that they resisted it for so long. 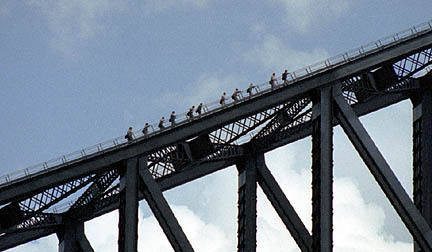 The BridgeClimb experience takes a total of three hours or so, but the first hour is mostly taken up with training. 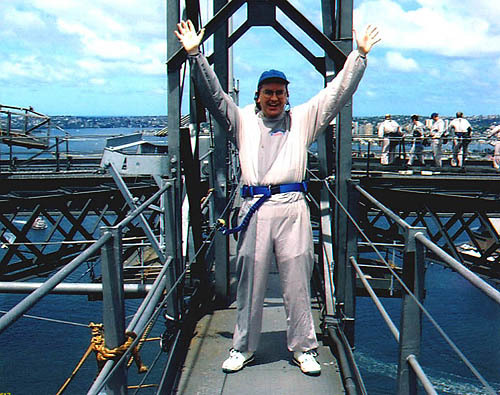 Eventually, after you’ve been kitted out, instructed in how to tackle the bridge’s steep ladders and narrow walkways, and shown how to use all the safety gear, you follow your climb leader outside and down the street to the point where the climb begins. The journey proper begins on this catwalk running underneath the roadway. From here on, your harness is attached via safety line to a wire that runs alongside the entire route of the climb. If you’re scared of heights, it’s too late now to ’fess up. 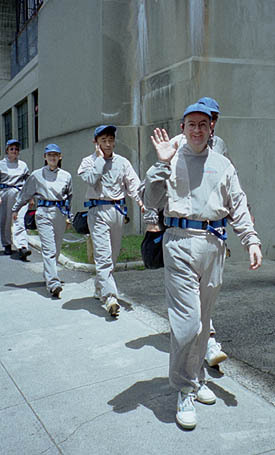 Throughout the climb, you’re in two-way radio contact with the climb leader, who provides a running commentary and answers any questions from the group. 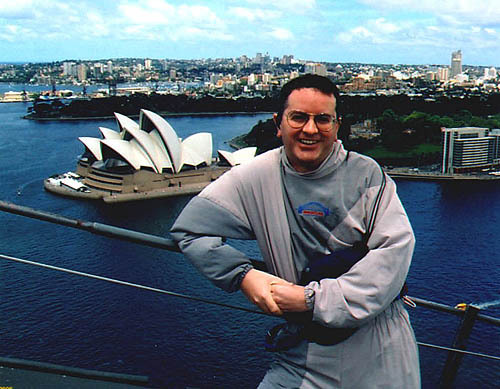 One of Sydney’s finest landmarks  the Opera House, not my leering mug  viewed from the other. Somewhere just over the horizon is Bondi Beach. This, finally, is what it’s all about. 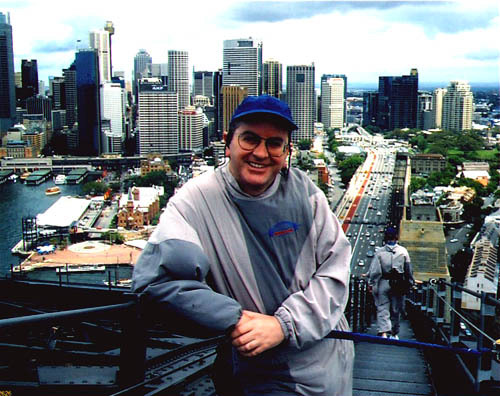 Grinning like a ninny at the top of one of Australia’s best known  and best loved  pieces of human endeavour; what Billy Connolly called "the world’s biggest Meccano set". 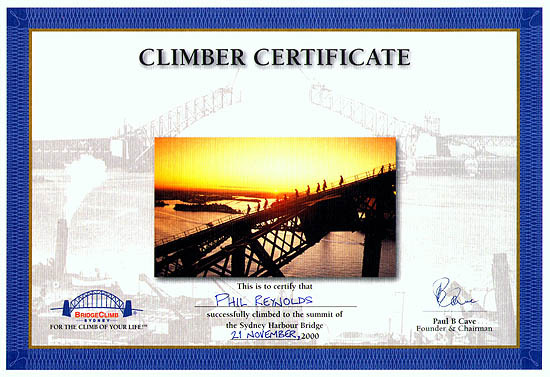 You can also do night-time climbs of the bridge, with a head light added to your inventory of safety gear and the spectacle of Sydney, the Opera House and the harbour twinkling away by a million artificial lights beneath you. Do it again? I can’t wait.